A volcano is an impressive sight. When they are dormant, they loom large over everything on the landscape. When they are active, they are a destructive force of nature that is without equal, raining fire and ash down on everything in site. And during the long periods when they are not erupting, they can also be rather beneficial to the surrounding environment. But just what causes volcanoes? When it comes to our planet, they are the result of active geological forces that have shaped the surface of the Earth over the course of billions of years. And interestingly enough, there are plenty of examples of volcanoes on other bodies within our Solar System as well, some of which put those on Earth to shame! By definition, a volcano is a rupture in the Earth’s (or another celestial body’s) crust that allows hot lava, volcanic ash, and gases to escape from a magma chamber located beneath the surface. The term is derived from Vulcano, a volcanically-active island located of the coast of Italy who’s name in turn comes from the Roman god of fire (Vulcan). On Earth, volcanoes are the result of the action between the major tectonic plates. These sections of the Earth’s crust are rigid, but sit atop the relatively viscous upper mantle. The hot molten rock, known as magma, is forced up to the surface – where it becomes lava. In short, volcanoes are found where tectonic plates are diverging or converging – such as the Mid-Atlantic Ridge or the Pacific Ring of Fire – which causes magma to be forced to the surface. 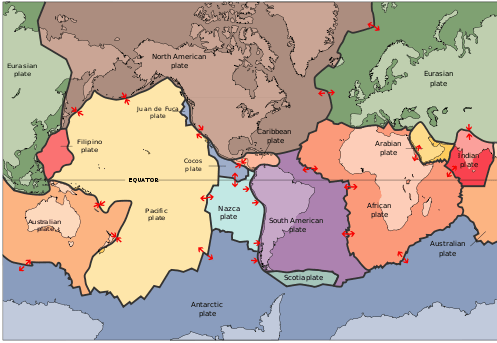 Volcanoes can also form where there is stretching and thinning of the crust’s interior plates, such as in the the East African Rift and the Rio Grande Rift in North America. Volcanism can also occur away from plate boundaries, where upwelling magma is forced up into brittle sections of the crust, forming volcanic islands – such as the Hawaiian islands. Erupting volcanoes pose many hazards, and not just to the surrounding countryside. In their immediate vicinity, hot, flowing lava can cause extensive damage to the environment, property, and endanger lives. However, volcanic ash can cause far-reaching damage, raining sulfuric acid, disrupting air travel, and even causing “volcanic winters” by obscuring the Sun (thus triggering local crop failures and famines). There are four major types of volcanoes – cinder cone, composite and shield volcanoes, and lava domes. Cinder cones are the simplest kind of volcano, which occur when magma is ejected from a volcanic vent. The ejected lava rains down around the fissure, forming an oval-shaped cone with a bowl-shaped crater on top. They are typically small, with few ever growing larger than about 300 meters (1,000 feet) above their surroundings. Composite volcanoes (aka. stratovolcanoes) are formed when a volcano conduit connects a subsurface magma reservoir to the Earth’s surface. These volcanoes typically have several vents that cause magma to break through the walls and spew from fissures on the sides of the mountain as well as the summit. These volcanoes are known for causing violent eruptions. And thanks to all this ejected material, these volcanoes can grow up to thousands of meters tall. Examples include Mount Rainier (4,392 m; 14,411 ft), Mount Fuji (3,776 m; 12,389 ft), Mount Cotopaxi (5,897 m; 19,347 ft) and Mount Saint Helens (2,549 mm; 8,363 ft). Shield volcanoes are so-named because of their large, broad surfaces. With these types of volcanoes, the lava that pours forth is thin, allowing it to travel great distances down the shallow slopes. This lava cools and builds up slowly over time, with hundreds of eruptions creating many layers. They are therefore not likely to be catastrophic. Some of the best known examples are those that make up the Hawaiian Islands, especially Mauna Loa and Mauna Kea. Volcanic or lava domes are created by small masses of lava which are too viscous to flow very far. Unlike shield volcanoes, which have low-viscosity lava, the slow-moving lava simply piles up over the vent. The dome grows by expansion over time, and the mountain forms from material spilling off the sides of the growing dome. Lava domes can explode violently, releasing a huge amount of hot rock and ash. Volcanoes can also be found on the ocean floor, known as submarine volcanoes. These are often revealed through the presence of blasting steam and rocky debris above the ocean’s surface, though the pressure of the ocean’s water can often prevent an explosive release. In these cases, lava cools quickly on contact with ocean water, and forms pillow-shaped masses on the ocean floor (called pillow lava). Hydrothermal vents are also common around submarine volcano, which can support active and peculiar ecosystems because of the energy, gases and minerals they release. Over time, the formations created by submarine volcanoes may become so large that they become islands. Volcanoes can also developed under icecaps, which are known as subglacial volcanoes. In these cases, flat lava flows on top of pillow lava, which results from lava quickly cooling upon contact with ice. When the icecap melts, the lava on top collapses, leaving a flat-topped mountain. Very good examples of this type of volcano can be seen in Iceland and British Columbia, Canada. Volcanoes can be found on many bodies within the Solar System. Examples include Jupiter’s moon Io, which periodically experiences volcanic eruptions that reach up to 500 km (300 mi) into space. This volcanic activity is caused by friction or tidal dissipation produced in Io’s interior, which is responsible for melting a significant amount of Io’s mantle and core. It’s colorful surface (orange, yellow, green, white/grey, etc.) shows the presence of sulfuric and silicate compounds, which were clearly deposited by volcanic eruptions. The lack of impact craters on its surface, which is uncommon on a Jovian moon, is also indicative of surface renewal. Mars has also experienced intense volcanic activity in its past, as evidenced by Olympus Mons – the largest volcano in the Solar System. While most of its volcanic mountains are extinct and collapsed, the Mars Express spacecraft observed evidence of more recent volcanic activity, suggesting that Mars may still be geologically active. Much of Venus’ surface has been shaped by volcanic activity as well. While Venus has several times the number of Earth’s volcanoes, they were believed to all be extinct. However, there is a multitude of evidence that suggests that there may still be active volcanoes on Venus which contribute to its dense atmosphere and runaway Greenhouse Effect. For instance, during the 1970s, multiple Soviet Venera missions conducted surveys of Venus. These missions obtained evidence of thunder and lightning within the atmosphere, which may have been the result of volcanic ash interacting with the atmosphere. Similar evidence was gathered by the ESA’s Venus Express probe in 2007. This same mission observed transient localized infrared hot spots on the surface of Venus in 2008 and 2009, specifically in the rift zone Ganis Chasma – near the shield volcano Maat Mons. The Magellan probe also noted evidence of volcanic activity from this mountain during its mission in the early 1990s, using radar-sounding to detect ash flows near the summit. In addition to “hot volcanoes” that spew molten rock, there are also cryovolcanoes (aka. “cold volcanoes”). These types of volcanoes involve volatile compounds – i.e. water, methane and ammonia – instead of lava breaking through the surface. They have been observed on icy bodies in the Solar System where liquid erupts from ocean’s hidden in the moon’s interior. For instance, Jupiter’s moon Europa, which is known to have an interior ocean, is believed to experiences cryovolcanism. The earliest evidence for this had to do with its smooth and young surface, which points towards endogenic resurfacing and renewal. Much like hot magma, water and volatiles erupt onto the surface where they then freeze to cover up impact craters and other features. In addition, plumes of water were observed in 2012 and again in 2016 using the Hubble Space Telescope. These intermittent plumes were observed on both occasions to be coming in the southern region of Europa, and were estimated to be reach up to 200 km (125 miles) before depositing water ice and material back onto the surface. In 2005, the Cassini-Huygens mission detected evidence of cryovolcanism on Saturn’s moons Titan and Enceladus. In the former case, the probe used infrared imaging to penetrate Titan’s dense clouds and detect signs of a 30 km (18.64 mi) formation, which was believed to be caused by the upwelling of hydrocarbon ices beneath the surface. On Enceladus, cryovolcanic activity has been confirmed by observing plumes of water and organic molecules being ejected from the moon’s south pole. These plumes are are thought to have originated from the moon’s interior ocean, and are composed mostly of water vapor, molecular nitrogen, and volatiles (such as methane, carbon dioxide and other hydrocarbons). In 1989, the Voyager 2 spacecraft observed cryovolcanoes ejecting plumes of water ammonia and nitrogen gas on Neptune’s moon Triton. These nitrogen geysers were observed sending plumes of liquid nitrogen 8 km (5 mi) above the surface of the moon. The surface is also quite young, which was seen as indication of endogenic resurfacing. It is also theorized that cryovolcanism may also be present on the Kuiper Belt Object Quaoar. Here on Earth, volcanism takes the form of hot magma being pushed up through the Earth’s silicate crust due to convention in the interior. However, this kind of activity is present on all planet that formed from silicate material and minerals, and where geological activity or tidal stresses are known to exist. But on other bodies, it consists of cold water and materials from the interior ocean being forced through to the icy surface. Today, our knowledge of volcanism (and the different forms it can take) is the result of improvements in both the field of geology, as well as space exploration. The more we learn of about other planets, the more we are able to see startling similarities and contrasts with our own (and vice versa). We have written many interesting articles about volcanoes here at Universe Today. Here’s 10 Interesting Facts About Volcanoes, What are the Different Types of Volcanoes?, How Do Volcanoes Erupt?, What Are The Benefits Of Volcanoes?, What is the Difference Between Active and Dormant Volcanoes? For more information, be sure to check out What is a Volcano? at NASA Space Place. Astronomy Cast has an episode on the subject – Episode 141: Volcanoes Hot and Cold. How Do We Terraform Saturn’s Moons? Continuing with our “Definitive Guide to Terraforming“, Universe Today is happy to present our guide to terraforming Saturn’s Moons. Beyond the inner Solar System and the Jovian Moons, Saturn has numerous satellites that could be transformed. But should they be? Around the distant gas giant Saturn lies a system of rings and moons that is unrivaled in terms of beauty. Within this system, there is also enough resources that if humanity were to harness them – i.e. if the issues of transport and infrastructure could be addressed – we would be living in an age a post-scarcity. But on top of that, many of these moons might even be suited to terraforming, where they would be transformed to accommodate human settlers. As with the case for terraforming Jupiter’s moons, or the terrestrial planets of Mars and Venus, doing so presents many advantages and challenges. At the same time, it presents many moral and ethical dilemmas. And between all of that, terraforming Saturn’s moons would require a massive commitment in time, energy and resources, not to mention reliance on some advanced technologies (some of which haven’t been invented yet). Every year, the NASA Innovative Advanced Concepts (NIAC) program puts out the call to the general public, hoping to find better or entirely new aerospace architectures, systems, or mission ideas. As part of the Space Technology Mission Directorate, this program has been in operation since 1998, serving as a high-level entry point to entrepreneurs, innovators and researchers who want to contribute to human space exploration. This year, thirteen concepts were chosen for Phase I of the NIAC program, ranging from reprogrammed microorganisms for Mars, a two-dimensional spacecraft that could de-orbit space debris, an analog rover for extreme environments, a robot that turn asteroids into spacecraft, and a next-generation exoplanet hunter. These proposals were awarded $100,000 each for a nine month period to assess the feasibility of their concept. Icy volcanoes are likely responsible for changes in brightness on the surface of Titan, the largest moon of Saturn, according to a new study. Images with the Cassini spacecraft’s visual and infrared mapping spectrometer revealed the brightness, or albedo, of two equatorial areas changing during the study period. Tui Regio (which got darker from 2005 to 2009) and Sotra Patera (which got brighter from 2005 to 2006). The researchers also pointed to “volcanic-like features” in these areas as evidence that the potential cryovolcanoes, as these icy volcanoes are known, might be connected to an ocean on Titan. Top: Sotra Patera, a cryovolcanic candidate on Titan that has a one-kilometer crater. (Credit: NASA/JPL Caltech/USGS/University of Arizona). Bottom: The Kirishima volcano in Japan, a terrestrial analogue (Credit: USGS). “All of these features, plus a need for a methane reservoir and volcanic activity to replenish the methane in the atmosphere, is compatible with the theory of active cryovolcanism on Titan,” stated Anezina Solomonidou , a planetary geologist with the Paris Observatory as well as the National and Kapodistrian University of Athens. “These results have important implications for Titan’s potential to support life, as these cryovolcanic areas might contain environments that could harbor conditions favorable for life,” Solomonidou added. Of note, Titan also has a fresh-looking surface with few craters on it, indicating that something might be altering the surface. “Its landscape is remarkably Earth-like with dunes and lakes, erosion due to weathering and tectonic-like features,” a statement on the research added. There’s been chatter about cryovolcanoes on Titan before. In 2010, researchers said a chain of peaks found on the moon could be evidence of this type of feature. However, a 2012 preliminary California Institute of Technology weather model of the moon explained many of its features without necessarily needing to rely on cryovolcanoes. While icy cryovolcanoes on Titan have been theorized in the past, scientists didn’t have any hard evidence for them. But now, researchers from the Cassini mission have found proof that jumped out of their data in the form of 3-D mountain peaks. Using a new three-dimensional mapping technique, the team was able to create a realistic 3-D flyover of a region on Titan, above, where volcanic-like mountains appear to be lined up in a mountain range-type formation, complete with calderas and material flows. If cryovolcanoes do exist on Titan, they would potentially answer the question of why Titan has so much methane in its atmosphere. “A combination of features makes us think we’ve found the best evidence so far for icy volcanoes on the moon Titan,” said Randy Kirk, a geophysicist with the U.S. Geological Survey and a member of the Cassini team. “Sotra Facular is a classic volcano with a crater on it and lava flows coming out of it. Kirk presented the team’s findings at the American Geophysical Union conference in San Francisco. Scientists have suspected cryovolcanoes might populate Titan, and the Cassini mission has collected data on several previous passes of the moon that suggest their existence. Kirk shared radar imagery from early in the Cassini spacecraft’s mission that showed Sotra Facular as bright spot on Titan’s equatorial sand sea, as seen above. Combining new data from Cassini’s radar instrument and the visual and infrared mapping spectrometer, the team was able to create the 3-D flyover movie, which shows two peaks more than 1,000 meters (3,000 feet) tall and multiple craters as deep as 1,500 meters (5,000 feet). It also shows finger-like flows. All of these are land features that indicate cryovolcanism. Kirk said the flows were quite thin – thinner than anticipated at less than 100 meters (300 feet) thick — but there were more volcanoes in the same field as Sotra Facula than what the team expected. In the video, mountains appear, with a huge pit like a volcanic calderas –“ a big bite out of the mountain,” as Kirk described it. The topography in the video has been vertically exaggerated by a factor of 10. The false color in the initial frames show different compositions of surface material, as detected by Cassini’s visual and infrared mapping spectrometer. In this color scheme, dunes tend to look relatively brown-blue. Blue suggests the presence of some exposed ice. Scientists think the bright areas have an organic coating that hides the ice and is different and lighter than the dunes. The finger-like flows appear bright yellowish-white, like the mountain and caldera. The second set of colors shows elevation, with blue being lowest and yellow and white being the highest. Here, the dunes appear blue because they tend to occupy low areas. Cryovolcanism could release methane from Titan’s interior, which explains Titan’s seemingly continuous supply of fresh methane in its atmosphere. Without replenishment, scientists say, Titan’s original atmospheric methane should have been exhausted long ago. Kirk and his team calculated that a Sotra-sized volcanic eruption every 1,000 years would maintain the current level of methane in Titan’s atmosphere. Jeff Kargel from the University of Arizona, who provided an independent assessment of the potential of cryovolcanoes on Titan, said that no one yet knows what the flows are made of from these volcanoes, but — providing a tantalizing visualization — said an ammonia-water cryolava with methane and carbon dioxide would make frothy, pumice-like deposits on Titan. For more imagery from Kirk’s presentation and other presentations about the Saturn system at AGU, see this NASA webpage.